Let me begin by saying that I object to the term 'woman artist.' I am an artist. Also, I do not see myself as a crusader because of the time one has been born in. I certainly feel that the times are different and each artist has her/his own respective journey to make and experiences to learn from,' says Sheila Makhijani, one of the serious painters of the new millennium. How different she sounds and how much more self-assured than the women artists who came before her in the seventies — neither those self-conscious and self-effacing remarks nor the pressure to prove herself as a woman artist. There is also no compulsive need to probe the layers feminine or feminist psyche. But this confidence is not born in a vacuum. It is the result of some very hard work put in the field of art by women who came before them. Although traditional Indian art always had woman practitioners even if they remained anonymous, as far as modern Indian art goes, the First Lady of the Canvas was Amrita Sher-Gil (1913-1941). Sher-Gil, with her mixed Indo-Hungarian parentage, aristocratic background and Parisian training in art, was the lone star in the colonial times. There was a long lull after Independence for the women artists to come into their own, but they did so in the seventies, equipped with professional training and determined enough to break into the male bastion. These women were not afraid of painting like women and making their own place in art, and they achieved it with hard work and talent. One would like to name just a few of these driven women, who are now celebrated names of the vibrant Indian art scene: Nalini Malini, Anjolie Ela Menon, Gogi Saroj Pal, Arpita Singh, Nilima Sheikh and many others. The next generation of women artists is not shy to acknowledge the contribution these women made, and 'happening' artist Anjum Singh, daughter of Arpita and landscape painter Paramjit Singh, does salute her mother's generation: think our generation is extremely lucky as the generations before us have fought and resolved a lot of issues and given us a big platform to express our ideas freely." Born in Delhi in 1967, she studied first at Santiniketan and then did a course in print-making from the Concoran School of Art, Washington DC. It was in the US that she started working with different mediums. A true child of her age, she is concerned with the environmental deterioration and so, she uses old bottles, ice-cream sticks, metal strips, throwaway plastic and the like to build her works of art. Her works on environmental hazards include Bumper to Bumper, Wormy Water, and Spit, the last being a critique on the betel-spitting Indian population. She makes a scintillating commentary on society by using painted soft-drink bottles to construct flowers with petals of plastic to indicate the 'cola bloom'. "My concerns are the environment and society that we live in. The art market has never interested me and I have never been bothered by it." Another child of artist parents is Manisha Parekh, born to Manu and Madhavi Parekh, who, by the strength of her painting, has been able to carve a niche for herself and prove that the large banyan tree need not necessarily dwarf young saplings. She is deft at Spinning Secrets, which, incidentally, was the name of her fifth solo show sponsored by the Nature Morte Gallery in New Delhi last Fall. 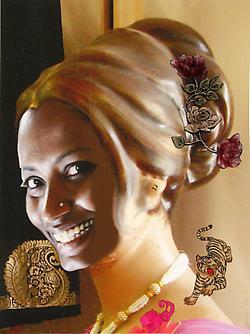 Manisha, unlike her forerunners, chose to move far away from the figurative to experiment with the abstract. Texturing, layering and perforating her paintings have endowed them with a sculptural quality. The woman or the womanly is very much a part of her works, which sometimes resemble ancient tapestries with minimal motifs, and she is proud to say: "I am no torch-bearing feminist, and would describe my work as feminine. I have been able to translate newer perceptions into my works, make the space to cohabit." New perception is the key word to approach and understand these artists of the next generation. At times, the departure from the practised and the traditional is so great that the viewer is amazed. One such artist who has done bold and brilliant experimentation in video art is Sonia Khurana. As a visual media artist, she works in the area in between video, photography, performance, installation and public art. Her use of her bare body, facing an unstable camera in flapping fluid movements of a bird, is a telling comment on the stereotypes imposed by society on the female form. my work, I often make psycho-sexual enquiries into two main areas of experience: interiority, or embodied experience, and the dynamics of identity. Through deliberate poetic imitations, I strive to explore and redefine the space of the political." Many women, many ideas, many streams and many trends make the current art scene so vibrant. There are artists who, while looking forward, do carry with them the spirit of the past. Mithu Sen, who has sometimes overwhelmed and, at other times, simply shocked people with the sexual overtones of her works, says: wish I'd been an artist in the 1970s, when being a feminist was glamorous and contemporary, but I was born carrying the gene of feminism." Mithu draws sexuality from both the animate and the inanimate. She says of her works: 'sexual overtone' in my work is to provoke and trap people, to force them to see. I try to engage the viewer, so that there's interaction and the art becomes a performance." These are the artists of the brave new world who will give shape, form and colour to the 21st century, liberating themselves and their art in the process. But what does their womanhood mean to them? Probe deep enough and the answer is that it means a lot, but it is not the pivotal point of their art. does it mean being a woman?" asks Anjum and then replies, "It is difficult to say what it would be otherwise. My observations and choices are so because I am a woman. So I suppose my art, too, is obviously the result of that. However, I must add that when I create art, my being a woman does not play an important role at all." The present times are seeing some most interesting experimentation by artists in different mediums. Women artists too are no loner content to just re-image the woman on canvas or paper. Some very exciting video art experiments are happening and there are others who are making installations, glow signs and what not. Many are using their own image to make a statement with a difference. The story is being told in an innovative manner, and this becomes very exciting when the medium, form and content combine to cast a spell. Your first solo show was titled 'I Hate Pink'. Why so? I wanted to break the cliche of pink and girls. There was also an incident from my childhood with this colour. My mother once took my sister and me to a festival and bought us both baby-pink frocks. Someone in the crowd told me that pink was not my colour – pink was not for dark skins (my sister has a fair complexion). At that young age pink was removed from my palette, and it became the parting point between my sister and I. What goes into the making of your art? All my memories, past, knowledge and experiences work together when I make art. The piece may have a particular subjectivity and objectivity, but deep down it shows the inner psyche and understanding about life. How do you you deal with fantasy and reality? The word fantasy does not exist form me because the fantastic can often be real too. The word fantasy has a particular perspective. What is a fantasy to you could be a reality to me. Your Free Art project was much talked about. Tell us about it? I wanted to break the art-mart system and replace it with giving and gifting. I asked people to send me a letter and I would give them a work of art for free. I was not a loser because I saw much creativity in the letters that were sent to me as they took the shape of diaries, sweater, box of mangoes, artworks, having tea with someone, evening walk with another, or a long distance telephone call.